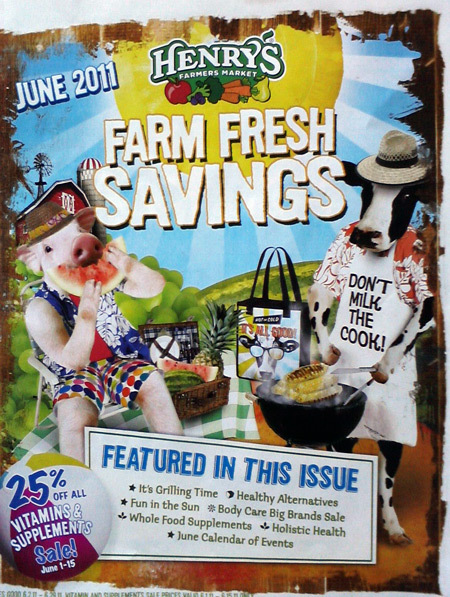 This month, Mrs Cow and Mr Pig are getting ready to kick off the summer with a barbecue in their barnyard. What a brilliant idea! I can see Mr Pig is being… a typical pig, pigging out on watermelon while the cow does all the work. By the way, I know corn is a popular item to throw on the grill, but seriously, we should stop feeding corn to our cows. Bovines were made to graze on grass and are healthiest that way. There, I said it. “Don’t grill the cook”! Clever! I can’t believe they didn’t go for it!